There was this one year when I got to play the part of Librarian once a week. Eliza, my youngest, was still a year away from school, and in an entirely new world without a sibling home all day to play with. We thought about preschool, but for a variety of reasons, decided that wasn't how we wanted to set up these last few months with her at home. We were living in Manila at the time, and she and I explored together lots in those days. We ran errands and spent many hours on the couch, reading together. Our days were good, but I felt like something was missing. Now that all of her siblings were in school, so much of her time was spent in my grown up world. I wanted her to have a chance to see her friends. I wanted her to get a taste of structured learning, but only a tiny nibble at a time. I wanted her to have something special to look forward to each week. And then it occurred to me what was missing. We needed a Story Hour. It had been years since I'd lived in the States and could go to the local library for an hour of books. But, I had such fond memories of those weekly outings--gathering with other mothers, and enjoying the pages of a book with my littles. So, I instituted a Story Hour of our own. I gathered up friends with an invitation that promised only "general literary excitement". I played the part of Librarian, learning to read upside down (a task not to be taken for granted), and discovering which books in my arsenal translate best for a crowd. Another friend provided the music time. She got us jumping, and crawling; prowling and growling. To celebrate the love of books, Eliza and I dragged every box of books in our house to the front room, to be perused. And, each week, I would set out groupings of books that I called "Three Reads". I would choose three books that I love, that fit together in some way, and display them with a sign: "Three Reads to Welcome Fall", or "Three Vintage Reads Your Children Shouldn't Miss". They were loose gatherings, based more on my own heart than any strict theme or narrative. But, I loved being able to share them with my people. I couldn't have anticipated all the good that those mornings would do for me. Among my friends and my books, there was so much good unraveling happening. Eliza often brings up those mornings and we reminisce like two old ladies. In honor of those days, and the wonder of sharing books, I'd like to institute a digital edition of Three Reads. Just like their analog predecessors, these will be groupings of books that strike me as fitting companions. There's something or another in each of them that makes me want to share them here with you. I can't think of any better place to start our Three Reads than in celebration of everything those home-grown Story Hours were all about: the power of sharing stories. The first comes from one of my favorite author and illustrator combinations. I love Sarah Steward's words and David Small's gentle pictures. A classic tale of a bibliophile, and the inevitable consequences of living that life to the fullest. 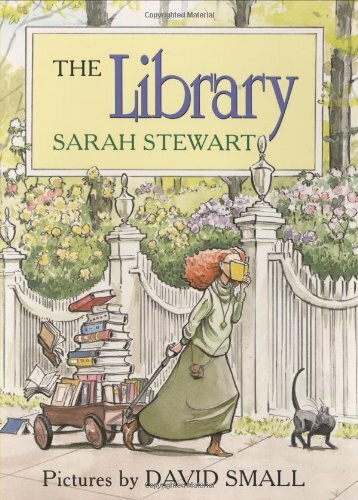 Elizabeth Brown is charming and this sweet book celebrates the way most of us share stories today--in our public libraries. My first memories of going to the "Library" were of a bookmobile that would park near our street once a week. That purveyor of wonder on wheels was my first experience with the euphoria of browsing among the skinny spines, and choosing a new treasure to bring home, even if for just a week. 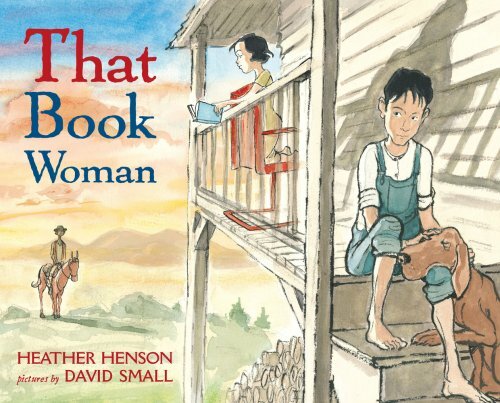 This story tells of the early precursors to my beloved bookmobile: librarians (mostly women) who would ride all over the Appalachian mountains bringing books to the people who couldn't come to the books. Having grown up on both sides of those mountains, in Kentucky and Virginia, this story is particularly poignant to me. Our first expat experience was living in Japan, when we had just four little ones, and they were little. Though we saw other expats at church, our day to day lives were more Japanese than expat. Steve worked in a Japanese office, the oldest two attended a local school, and we lived in a traditional home among Japanese neighbors. It was wonderful and immersive, and so very isolating at times. It was no small thing, then, when a new friend marched me into the local library (just a short walk from our house, though I didn't know it), and helped me fill out the paperwork for a library card. Everything, everything is better, Friends, when you have a library card. It was that same morning that she also taught me about Kamishibai. Browsing the children's section (and mostly its slim English language section), we saw big wooden bins full of large envelopes that I may have ignored completely, were it not for my friend's instruction. She insisted that we check out a few along with our pile of books. She pulled out an envelope and slid the giant cards from their sleeve. She taught me how to use these clever story devices. Holding up the set of cards, the picture displays on front for the audience, and on the back card, are the words to go along (no reading upside down even required!). When you "flip the page" (sliding that card to the back, your next bit of narrative is there waiting for you. Ingenious and engaging and one of our favorite finds from our time in Japan. This beautiful book tells the story of one Kamishibai man, and how Kamishibai used to be told around Japan. 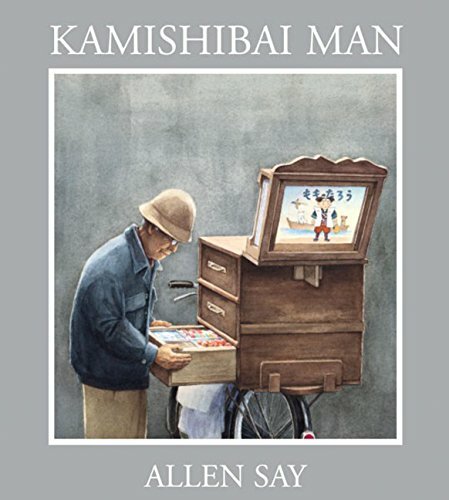 I love Allen Say's artwork anyway, and I was thrilled to discover this book that told the tale of one of our favorite ways to share stories. Three Reads are never meant to be an exhaustive list. They're just a start to the conversation. So, tell me, what are your favorite reads to celebrate the power of sharing a story?